The tomb of the Venerable Bede, who died in 735 AD, is a regular place of prayer for me in the Galilee Chapel of this Cathedral. Bede was a mission theologian and historian, Bible commentator, natural scientist, and a scholar of ‘time’, especially of the date of Easter. He is the only British theologian to have been made a Doctor of Church in the Catholic Church. Bede wrote his seminal The Ecclesiastical History of the English People to show that God’s influence was relevant not only in the Holy Land but also in England. Let us pray for scholars like Bede who are working on similar projects in Africa, Asia, Middle East and Latin America. Bishop Alfred Lord Tucker is buried next to Durham Cathedral overlooking the river Wear. He was an artist, exhibited at the Royal Academy and served as pioneer CMS missionary in Uganda, where he was very sensitive to issues of inculturation. The theological college at Mukono, north of Kampala, was named after him: it is now Uganda Christian University. He was curate of St Nicholas, Durham 1885-90, Bishop Eastern Equatorial Africa 1890-99, Bishop of Uganda 1899-1911, and then returned to be Canon of Durham 1911-14. Let us pray for pioneers like Tucker from Africa, Asia, Middle East and Latin America. Dr Griphus Gakuru, who studied at Mukono, was very moved to pray by Tucker’s grave in March this year, before giving his seminar paper in our series in Durham. Bede’s statement, which implies that Theodore and Hadrian produced pupils who could read and write Greek with ease, claims for the school of Canterbury a proficiency in classical learning rivalled, so far as is known, by no other learned community north of the Alps. contains a unique contemporary description of Theodore’s teaching. Aldhelm was beyond comparison the most learned and ingenious western scholar of the late seventh century. I am very grateful to the Archbishop of Canterbury (successor of Theodore), the Church Mission Society (with whom Tucker served) and Durham University (where Bede is buried in the Cathedral) for founding this Mission Theology in the Anglican Communion project and for all their support in its embryonic stage, its birth a year ago and its development. Church, Mission and Academy interweave. Separately incoherent: together co-inherent. I also am very thankful to a considerable number of individuals and organisations for their financial funding and prayers. We shall be considering Sarah as the Mother of Mission in two parts: first, Exposition in Text, Painting and Poem; and Second, Ramifications in Mission, Theology and Theologians. Where in the Bible is Sarah mentioned as a mother of later generations? to the quarry from which you were dug. The anonymous prophet in Babylon, whom we designate as Second Isaiah, encouraged the Jewish exiles to look back and remember their origins. Not just to Abraham their ‘father’, but also ‘to Sarah who bore you.’ Sarah is their ultimate mother. In Galatians 4:21-31, Paul gives an allegory of the slave-girl Hagar (mother of Ishmael through Abraham) and Sarah (mother of Isaac, the promised son, through her husband, Abraham). Typical of a prophet, he turns the usual interpretation directed at gentiles against the Jews. Instead of Sarah representing the Jews and Hagar the gentiles, as would be expected, he has Sarah representing the Christian gentiles’ hope in the heavenly Jerusalem and Hagar signifying the Jewish Law given at Sinai and the present oppressive Jerusalem. He writes: ‘The other woman [Sarah] corresponds to the Jerusalem above: she is free, and she is our mother.’ (Galatians 4:26). In Galatians chapter 3, Paul stressed that Abraham is the spiritual father of all Christians, gentile Christians as well as Jewish Christians. In chapter 4, he states that Sarah is the mother of all Christians, gentile and Jewish. Genesis 15 recounts how the Lord tells Abram to look toward heaven for his descendants will be as numerous as the stars. Verse 6 states, ‘And he believed the Lord and it was reckoned to him as righteousness.’ This key verse for Paul’s doctrine of justification by faith, in Romans and Galatians, is chronologically and theologically prior to Abraham’s circumcision in chapter 17, which represented the law. Genesis 16 tells the story of the Egyptian slave-girl Hagar bearing Ishmael through Abram at the instigation of Sarai, who was barren and who then turned on her harshly. Genesis 17 is a parallel story to our passage, Genesis 18, from another tradition. It uses the name El for God, rather than Yahweh, the Lord. Both concern the promise of a son to Abraham. As creation is described in two stories (Genesis 1 using the name ‘God’ and Genesis 2 the name ‘Lord God’), so the promise of a son to Abraham has two stories in chapters 17 and 18. Chapter 17 shows us the name changes from Abram to Abraham and from Sarai to Sarah, describes the covenant, with its sign of circumcision, and announces the promise of a son through Sarah. Abraham laughs and suggests Ishmael will suffice (v 18). God insists, ‘No, but your wife Sarah, shall bear you a son and you shall name him Isaac.’ (v. 19) and that the covenant would be established with Isaac. The appearance was sudden and unexpected. Do not be surprised if the Lord takes you by surprise. It is typical. Mamre was near Hebron, which turns out later to be the burial place of Abraham and Sarah, Isaac and Rebekah, Jacob and Leah and where David was anointed King. Verse 2: ‘He looked up and saw three men standing near him. When he saw them, he ran from the tent entrance to meet them, and bowed down to the ground’. Running is unusual for an older man in Ancient Near Eastern culture, especially a man of 99 years. There is urgency. Verse 6 says Abraham ‘hastened into the tent to Sarah’, verse 7 he ran to the herd, the servant ‘hastened’ to prepare the calf and Sarah cooked the cakes. As we read this text from the perspective of the New Testament, we may be reminded of the ‘running’ of the father, and the killing of the ‘fatted calf’, in the parable of the Prodigal Son. I sometimes ponder that to the question ‘who was upset when the prodigal son returned?’ the proper answer should be ‘the fatted calf’. Table fellowship defines Jesus’ communality. Eating is patterned into the scheme of his work revealing a striking centrality of food to Jesus’ ministry…The most undeserving of people are given a place at the table, to be heard, healed, forgiven, restored, taught and fed to become beneficiaries of divine hospitality. In our passage, ironically, it is the divine visitors who receive hospitality. Who are these visitors? Verse 1 mentions The Lord. Verse 2 talks of three men. Verse 22 describes two men going towards Sodom while Abraham remained with the Lord, implying that one of the three was the Lord. Genesis 19 designates the two men as ‘Angels’ and in the New Testament Hebrew 13:1 says ‘some have entertained angels without knowing it.’ Somewhat confusing. But this obliqueness allows space for imagination. Rublev’s famous icon, painted in 1411, portrays the three ‘angels’ as the Holy Trinity. This theme of the veiling of the Lord is echoed in the Incarnation of the Son of God and also, differently, in Matthew 25, in Jesus’s parable of the Sheep and the Goats: his presence is veiled in the hungry, thirsty, naked, sick, and imprisoned. It also resonates with kings being veiled in the works of Shakespeare and Tolkien. In Henry V, the night before the battle of Agincourt, the King dons a cloak and, incognito, moves amongst his soldiers, talking with them and learning their views. In The Lord of the Rings, Aragorn, the rightful King who is eventually crowned in Book Three (in a wonderful passage which, perhaps, should be read on Ascension Day) appears early in Book One as Strider, the hooded Ranger in the Inn of the Prancing Pony in Bree. Verse 9: ‘Your wife shall have a son’. Sarah listens at the tent entrance. The Hebrew circumlocution is beautiful: ‘it had ceased to be with Sarah after the manner of women.’ So she laughed to herself. It is absurd. She had grown old. These words imply decay as of old clothes. ‘Shall I have pleasure’ implies sexual pleasure. Looking at Abraham the answer seems obvious to her. Verse 13: The Lord does not use quite such blunt language. ‘Why did Sarah laugh, and say, “Shall I indeed bear a child, now that I am old. Is anything too wonderful for the Lord?’ From a New Testament perspective, we remember Luke’s story of Gabriel’s words to Mary, ‘For nothing will be impossible with God’ (Luke 1:37) and also the surprise promise, by an angel of the Lord, of a son to Zechariah and the barren Elizabeth in their old age (Luke 1:5-25). Verse 15: Sarah denies she laughed, ‘for she was afraid’. The Lord contradicts her, ‘Oh yes, you did laugh’. You can kid other people. You can kid yourself. You cannot kid God. Both laughed. Abraham in chapter 17 and Sarah in chapter 18. But Sarah tried to hide it. I am very thankful for the interweaving friendship and theological partnership that my wife, Alison, and I have with Silvia Dimitrova, Bulgarian Orthodox icon writer and painter, over 15 years. She is based in Bath and her art is a vibrant gift from God to people of various Christian traditions and also to those who do not yet believe. 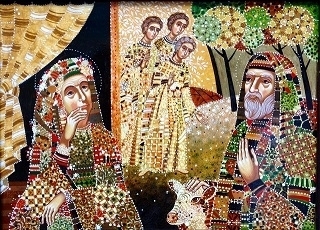 Her two styles of traditional icons and modern love paintings in Bulgarian folk style, the sacred and the secular, enrich and influence each other. They are inspiring in their profundity and fecundity. Usually, she does not mix her styles, but in our series of seven women in the Bible she does so. They are religious and yet set in Bulgarian folk style: iconic but not icons. So far we have four paintings and I have written four poems on them: Magdalene (2003) in the garden with the risen Jesus; Lydia (2009) at Philippi with Paul; Priscilla (2013) at Ephesus with Aquila; and Sarah (2015) with Abraham at Mamre. I have been meditating on this generative partnership. It is a process of imagination, incarnation and interpretation. Concerning ‘imagination’, I choose the people and the texts and Silvia and I discuss theological ideas together. She ruminates prayerfully on the passages, listens to a recording of me reading them, and prepares a sketch. Then Alison, my wife, and I meet with her in Bath to discuss it. In the case of ‘Sarah’, Silvia wanted to reflect something of the tradition of the famous mosaics of Abraham and Sarah in the Basilica of San Vitale, Ravenna. We looked at the photos in her book. Alison noted the preponderance of green in the mosaics and the lack of it in our previous three paintings. Thus, and thence, emanated the colour green. The three of us spent a lot of time pondering the facial features of the three visitors, who emerge as one: older in front, younger to the left and more feminine to the right. Ephrem the Syrian was one of the theologians of the 4th century to write of the Holy Spirit as ‘She’. Silvia wanted to include the calf and was persuasive: it looks towards the ‘ram caught in the thicket’ of Genesis 22, the sacrifice substituted for Isaac, and to the ‘fatted calf’ of Luke 15. Theological imagination, emerging out of joint pondering on the biblical text, then becomes ‘incarnate’ in the painting. During this period, Silvia heard that my mother was ill in hospital and asked for a photo of her and also of my father. She had not painted older people before, nor portraits of particular people. Sarah and Abraham bear a remarkable resemblance to my parents who are now both 90. My father has Abraham’s forehead and eyebrows, but not his beard. The apparently unimportant detail (the eyebrow) is the object of God’s care and craft for the sake of the larger picture. My mother lives in a residential home a short distance away from my father’s house. Both are delighted with this familial contextualisation. After ‘imagination’ and ‘incarnation’ the painting then becomes the subject of ‘interpretation’. This is by our friends who see it in our home, people who take part in Quiet Days based on the paintings, and also in my poems on each of them. I wrote ‘Sarah’ on a silent retreat with Alison, in February, at St Cuthman’s, Coolham, in Sussex. We move now to our second part: ramifications of this story of Sarah in mission, theology and theologians. Sarah is the mother of mission because she is the ‘mother of promise of people and nations’. Having been up to that point ‘forever empty’ (a devastating phrase in the poem), she miraculously becomes a mother, through the co-inherence of the act of love, which could, perhaps, be described as lawfully joined and joyfully loined. This co-inherence in marriage reflects in a different way the co-inherence of the Holy Trinity. The image of God may be seen here in loving inter-related personal beings. Sarah bore Isaac: all the Jews, including Jesus of Nazareth, trace themselves back through this ‘son of promise’. Those on the edge of Jewish society, like Zacchaeus the tax collector, who respond to Jesus of Nazareth are delighted in the good news: ‘Today salvation has come to this house, because he too is a son of Abraham.’ (Luke 19:1-10). In the first two chapters of Exodus, women and birthing are key to the narrative. The Hebrew midwives are brave in defying Pharoah’s commandment of infanticide for male babies. The mother of Moses hides him in the bulrushes and when Pharoah’s daughter finds him, Moses’s sister offers to find a wet nurse for him and then secretly arranges this to be his own mother, who brings him up and then later hands him over to the Princess. Moses’s mother follows in the footsteps of Sarah, like so many others, by delivering a son and handing him over for the eventual deliverance of her people. Mission begins with God and ends with God. Before time, in time and beyond time, God's very being is outward moving, in generation and procession. In time, the Father sends the Son into creation to set people free: the Embedded for the embittered. The Father sends the Spirit into the lives of his people: the Irrigator for the parched. We are drawn into this astonishing movement from God and towards God. In turn, we are sent by him to embody and to share his good news. So mission is not so much what we do, as following in the wake of what God is already doing: discerning his surprising purposes and joining in. Mission is an umbrella word, which covers all God sends us in his world to do with him. Included under it, is the interweaving of evangelism, development and justice, locally and throughout the world. David Bosch has the heading, ‘Mission as the Mother of Theology’ at the beginning of his magnum opus, Transforming Mission: Paradigm Shifts in the Theology of Mission. He took the phrase from a 1908 book by Martin Kahler. Paul, the former scribe, becomes the first Christian ‘theologian’ because he is a missionary; that is, his theology is ‘mission theology’ in the comprehensive sense. The missionary and theological work which he produced over a seven-to-eight year period (between about AD 49 and 57), when the church was barely twenty years old, has remained unparalleled over the subsequent 1900 years. The merciful request from Silvia Dimitrova, a mother, to have a photo of my mother led to the contextualisation of the painting in our family. This may be helpful in trying to understand the theme of ‘inculturation’ in mission theology. It involves discovering that the treasure of the good news of the kingdom of God is familiar at home. Christ comes to us in our cultures from the Father, not from missionaries, and is already embedded in our cultures, waiting to be unveiled, like the King incognito. The historic Christ, the Logos fully revealed, comes a story that must be told and an image reflected in other human lives – but he does not come as a stranger. He has been there all along, but his footprints were not on the most frequented paths and he is recognised as a face seen in half-forgotten dreams like that of the Suffering Messiah foreshadowed in the Old Testament but neglected in the ongoing tradition of Judaism. He comes to his own in the other faiths in another way also, in that he, the Logos incarnate once for all in Jesus of Nazareth, matches the need and fulfils the promise of each traditional world-view as though he had emerged from within it with no less relevance than he did within Judaism. We who stand outside the other traditions may only guess how this may be. He died in 2001 and would have been delighted with this project, and the many female mission theologians who have influenced it. Some are established and some are emerging in their academic work. My sensitivities to the issues of gender began with moving from Ghana to Nigeria; trying to teach theology in a department where all my colleagues were men, and trying to understand the status of women in patrilineal Africa where some of us are matrilineal. I had to write Daughters of Anowa, as well as many other articles and chapters in books. It was this experience that led to my taking the initiative which resulted in the formation of the Circle of Concerned African Women Theologians in 1989. The Circle was preceded by efforts on my part to identify and recommend African women theologians to become members of the Ecumenical Association of Third World Theologians, of which I am a current President. Lydia Mwaniki, from Kenya, is Director of Theology for the All Africa Council of Churches, and is the African editor of our SPCK series. She is coming on sabbatical to St John’s College, Durham in November this year and giving a seminar paper, at Durham and Lambeth Palace on ‘Gender and Sustainable Development in Africa’. Isabel Apawo Phiri, from Malawi, is Associate General Secretary of the World Council of Churches. Ruth Padilla DeBorst, from Argentina, is the Director of the Center for Interdisciplinary Theological Education, Costa Rica. Chair of the International Fellowship of Mission Transformation, she gave key bible studies at the third Lausanne Congress on World Evangelization, in Cape Town in 2010. Rosalee Valesso Ewell, from Brazil, is on the theological commission of the World Evangelical Alliance, and works at Newbigin House, Birmingham, England. Evangeline Anderson-Rajkumar, from India, was the Professor of Women’s Studies at the United Theological College, Bangalore, for many years and is now lecturing at the Lutheran Theological Southern Seminary, Columbia, United States. Jung-Sook Lee, from South Korea, is a Church Historian and President of Torch Postgraduate University, Seoul. Sandra Mazzolini, from Italy, is Professor of Mission Theology at the Pontifical Urbaniana University, Rome. Kirsteen Kim is Professor of World Christianity at Leeds Trinity University, and a former Vice Moderator of the Council for World Mission and Evangelism of the World Council of Churches. She is editor of Mission Studies and was a joint editor of the Regnum Edinburgh series of books on World Christianity. Cathy Ross has served in Rwanda, the Democratic Republic of Congo and Uganda and is lecturer in Contextual Theology at Ripon College, Cuddesdon, Oxford, MA coordinator for Pioneer Leadership Training at the Church Mission Society and lecturer in Mission at Regent’s Park College, Oxford. Emma Wild Wood is a lecturer in world Christianities at the University of Cambridge, on secondment for two years from the Cambridge Centre for Christianity Worldwide, which she has directed since 2009. She has taught theology in the Democratic Republic of Congo and in Uganda. It takes the whole world to understand the whole gospel. The Mission Theology in the Anglican Communion project is generative. It has already produced 37 articles on our website in a year. These have been born through two seminars a term each in Lambeth Palace and Durham University, through conferences in the global South (in the past Cairo in April, in the future Bangalore in October 2016, Jerusalem in March 2017, Brazil in April 2017 and Ghana in the autumn of 2017) and through intercontinental sabbaticals, south to north in Durham, Oxford, Cambridge, Virginia and Pennsylvania (beginning this Michaelmas Term) and, in the future, south to south. Our partnership with SPCK has been encouraging in three interweaving ways: the desk for my assistant, Georgie Morgan; the hosting of our website; and our new book series, Anglican Theologies: African, Asian, Middle Eastern and Latin American. These books – single authored and multi-authored – we plan to co-publish, at discounted costs, with publishers in the global South. Assisting me are four continental editors, to whom I am very grateful: The Revd Dr Lydia Mwaniki (Africa), mentioned above, Director of Theology for the All Africa Council of Churches; Dr Muthuraj Swamy, (Asia), Professor of Theology, Union Biblical Seminary, Pune, India; the Ven Dr Samy Shehata (Middle East), Principal of Alexandria School of Theology and Dean of St Mark’s Cathedral; and Professor Joanildo Burity (Latin America), Director, School of Postgraduate Studies and Professional Development, Fundacao Joaquim Nabuco, Recife, Brazil. Theology develops through friendship. In 1827, The Church Missionary Society founded the Fourah Bay Institution, which later became Fourah Bay College. Samuel Ajayi Crowther, the freed slave from Yorubaland (later Nigeria) was the first student. He later became the first African Anglican Bishop, consecrated in 1864, having trained at the CMS Institute in the parish of St Mary Islington, London. By the 1870s, [Fourah Bay] college was affiliated with Durham University in England, and was presenting students for degrees in arts and divinity. I am grateful to Michael Stansfield, the Deputy Head of Archives and Special Collections, at Durham University Library, for the information that Fourah Bay College was affiliated to Durham University in 1876 and became the independent University of Sierra Leone in 1967. While praying one time in Durham Cathedral, I had a sense of the bones of St Cuthbert at the east end and of the Venerable Bede at the west end, being like the deep roots of molar teeth, our back teeth. Over the centuries they have held the massive Cathedral onto the rocky peninsula. May these roots in the past encourage the writing, networking and publishing of future scholarship in Africa, Asia, the Middle East and Latin America. F M Stenton, Anglo-Saxon England (Oxford: OUP, 1971). Ibid p 183. See also A. M. Juster, Saint Aldhelm’s Riddles (Toronto: University of Toronto Press, 2015) pp. xiv-xv and 75-77 for the influence of Theodore and Hadrian on Aldhelm. Augustine, City of God (London: Folio Society, 2012), p. 461 [X1.22]. Rowan Williams, On Augustine (London: Bloomsbury, 2016), p. 93, referring to Augustine, City of God, XI.22. Therefore if any man can shew any just cause, why they may not lawfully be joined together, let him now speak, or else hereafter for ever hold his peace.’ ‘The Solemnization of Matrimony’ in The Book of Common Prayer (1662). David J. Bosch, Transforming Mission: Paradigm Shifts in Theology of Mission (Maryknoll, NY: Orbis Books, 1991). Martin Kahler, Schriften zur Christologie und Mission (Munich: Chr. Kaiser Verlag, 1908)..